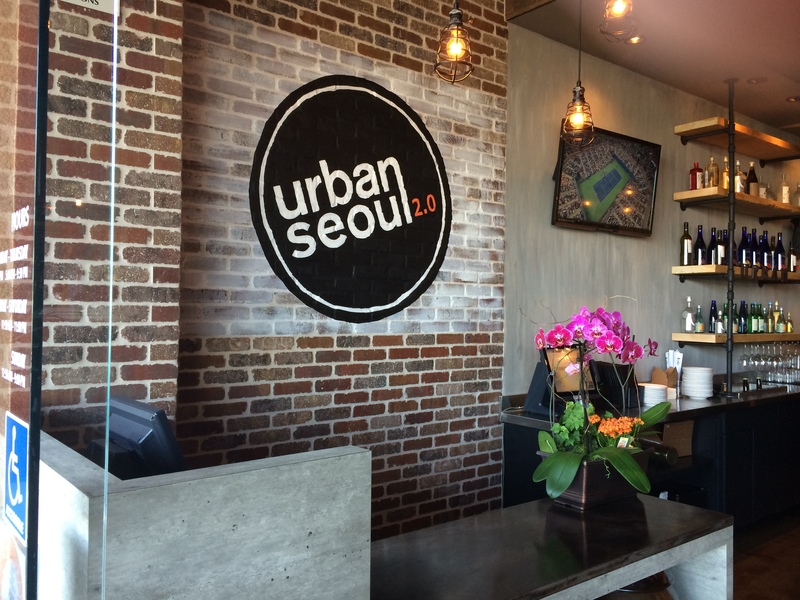 I have to admit, my exposure to Korean food has been somewhat limited to Korean Barbecue Short ribs, which by the way I love, so I didn’t know what to expect when invited to a media tasting at the newly opened Urban Seoul 2.0 at The Irvine Spectrum. This is Restaurateur Bronnie Lee and Chef Kacy Jun’s latest venture and like its sister’s Diamond Jamboree location, its foundation is Korean, while also pulling from other Asian as well as Mexican influences that are so popular here in Southern California. The restaurant boasts an outdoor patio with a well-lit open atmosphere inside. Its hip decor is industrial minimalist featuring metal and wood surfaces, a polished stained concrete floor and orchids to soften the edge. 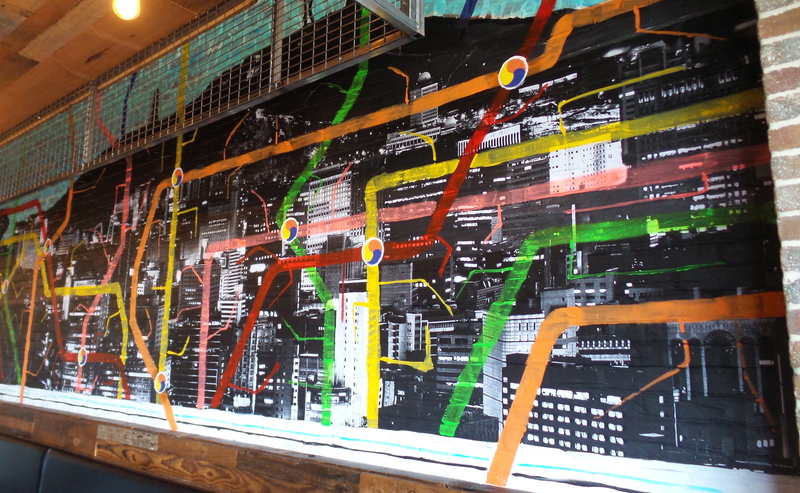 Two colorful original paintings including a mural of Seoul’s cityscape superimposed with its subway line by California painter K Fish add a vibrant energy to the room. 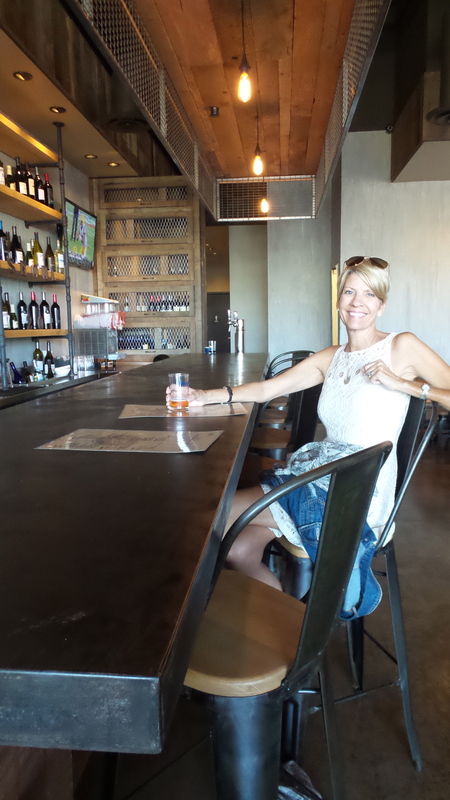 From the moment my sister, Shan and I walked in, we could not wait to start tasting. Arriving a little early, we decided to have a seat at the bar and have a cocktail while waiting for the other guests to arrive. We were invited to choose from a variety beer, wine, sake, soju and shochu. While very familiar with sake, I’ve never been clear on the difference between sake, shochu and soju so I found myself doing a little reading and here is what I learned in a nutshell… while sake is a brewed fermented rice wine, it’s Japanese sister shochu is a spirit distilled typically from barley, sweet potato, buckwheat or rice. Similarly Korea’s popular soju is a spirit distilled from rice, potato wheat or barley. These often have a lower alcohol by volume content and they are very adaptable when it comes to using them in cocktails. The perfect example of this adaptability is the soju margarita, a refreshing lime cocktail served in a salt rimmed glass. This is what I ordered. 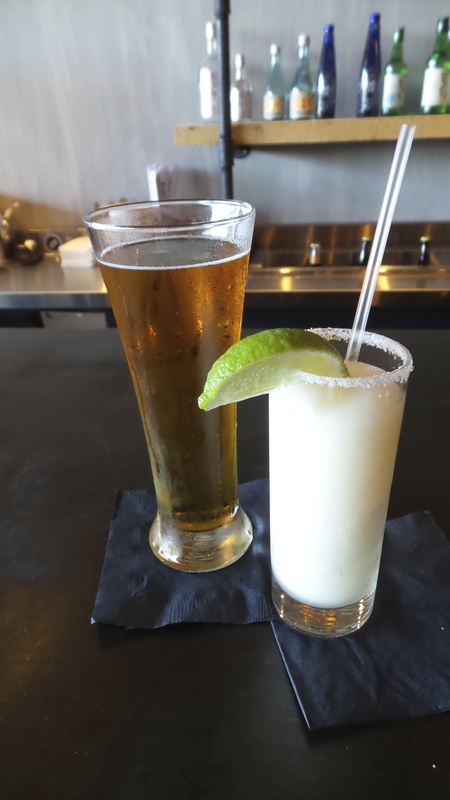 It was a milder, less sweet version of a margarita, almost skinny girl style. This, I enjoyed. Shan went for the Sculpin IPA. If you’re interested in a cocktail with a slightly sweet fruity twist you may decide on one of their flavored sakes which come in lychee, Asian pear, plum, and raspberry. As guests began to filter in we moved to the patio in the front of the restaurant and the flavor fest began. 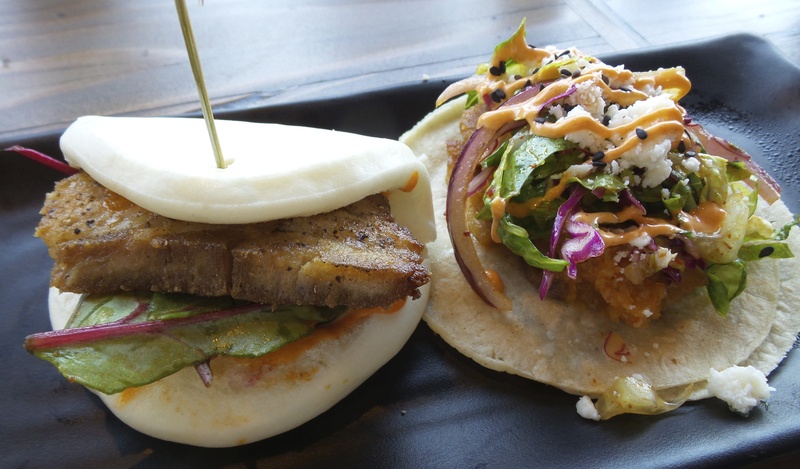 We started with what wound up being two of our favorites, the Urban Pork Bun and Pork Belly Tacos. The Urban Pork Bun is a soft pillowy steamed bun, smeared with savory gochujang and filled with pork belly that is braised and then seared. The added pickled cucumber kimchi makes for a mouthwatering combination. The tacos with crispy pork belly, cabbage, kimchee, queso fresco, gochujang aioli on corn tortillas are bursting with flavor and texture and they are also available with gogi, spicy pork, grilled chicken and tofu. But how could you pass up the pork belly? Knowing we had several dishes to sample I had planned on only taking one or two bites but I just could not help myself. I polished both of these off in alternating bites trying to determine which was my favorite and still couldn’t decide, though Shan declared the taco her favorite. 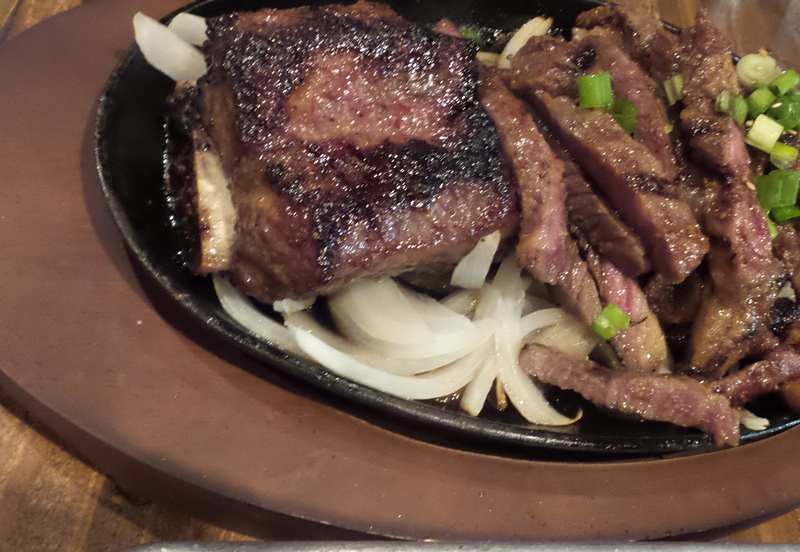 Next up was the Rib Eye Jun Torta. 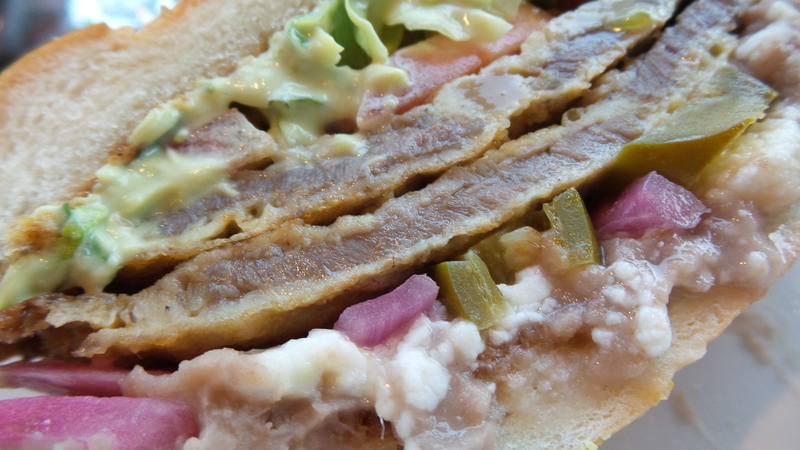 For the sandwich lovers out there this is made with thinly sliced marinated rib dipped in egg batter and layered with bacon pinto beans, queso fresco, romaine lettuce, roma tomato, pickled red onion, pickled jalapeño and avocado aioli. 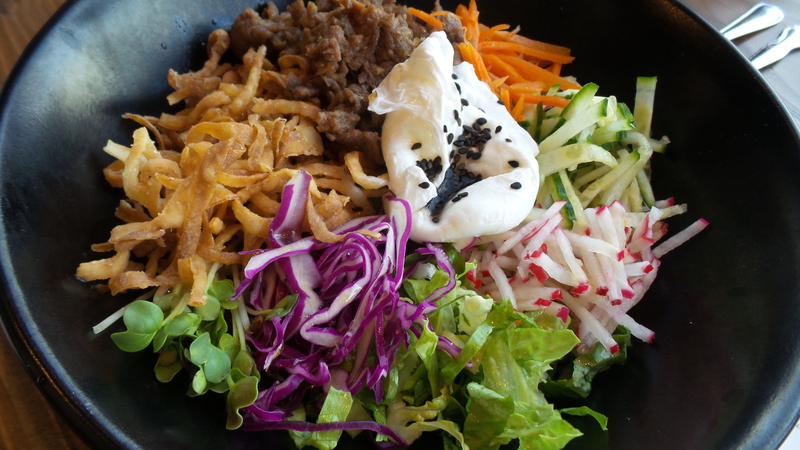 One of my favorite dishes was the Urban 3B Gogi, also known as “bibimbap, our way”. This colorful dish is beautiful and has so many textures and flavors going on with marinated sliced rib eye (gogi), shredded romaine lettuce, cucumber, red cabbage, radish, carrots, daikon, sprouts, fried onions and purple rice. It arrives with a poached egg on top, which we popped and tossed into the salad. You may also order this with pork belly, spicy pork, grilled chicken, tofu, spicy tuna or salmon sashimi. 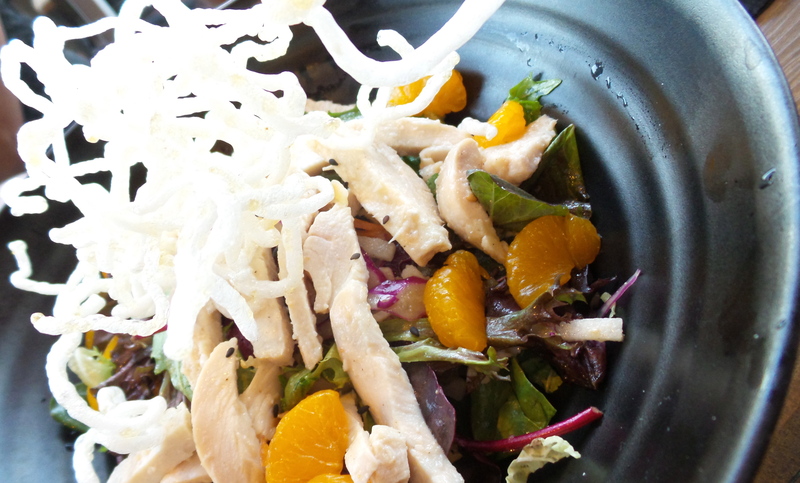 For those looking for something a little more straightforward there is a Chicken Salad served with oven roasted chicken breast, mixed greens, Napa cabbage, carrots, red bell peppers, mandarin oranges, jicama, roasted almonds and rice noodles with rice wine vinegar dressing. Urban Seoul’s menu also features several skillet dishes including the Elote Skillet, the Chorizo Kimchi Fried Rice Skillet, and the Wagyu Loco Moco Skillet. 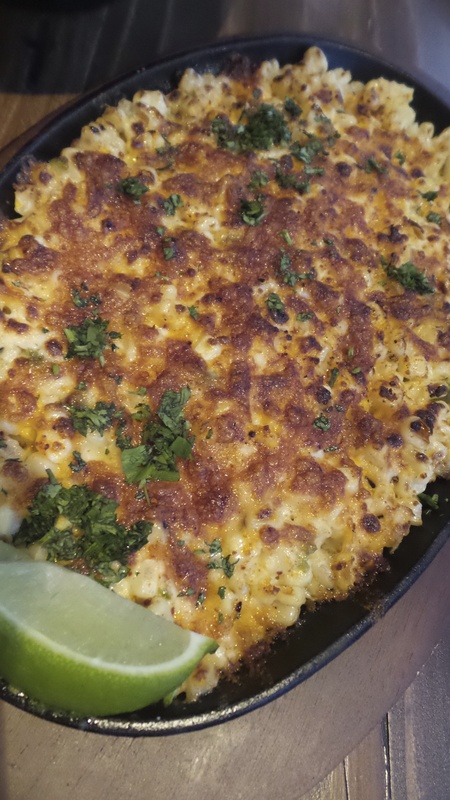 The Elote Skillet with grilled corn, cotija cheese, Korean chili flakes, smoked paprika, cilantro, lime wedges is perfect to share as a side dish. 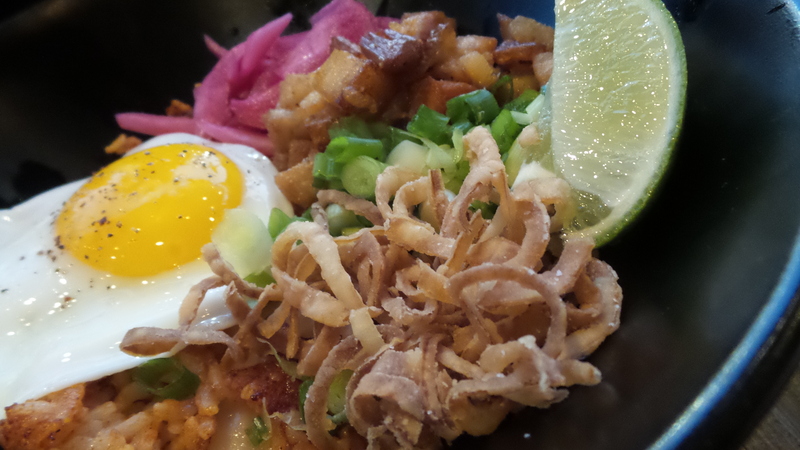 Another favorite, the Chorizo Kimchi Fried Rice Skillet with chorizo, bacon, pork belly, kimchi, rice, garlic, pickled red onions, green onions, and fried onion topped with a sunny side up egg is a meal in and of itself or a great side dish. 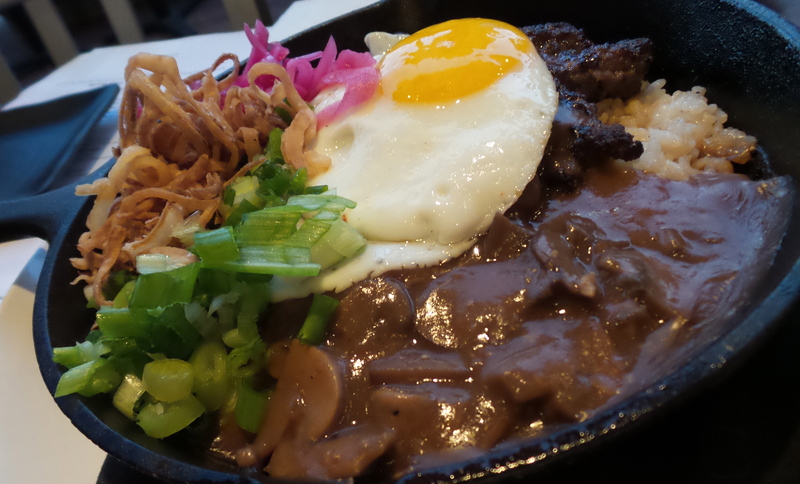 The Wagyu Loco Moco Skillet is served with marinated Wagyu beef patty, mushroom gravy, pickled red onions, fried onions, green onions, and sunny side up egg over crispy garlic fried rice. 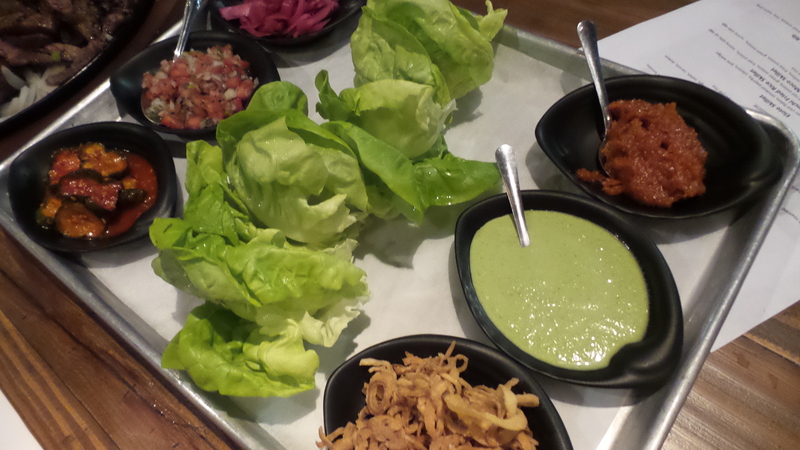 Finally we had some tableside fun assembling our own SSam Grilled Short Rib Lettuce Wraps. Lettuce wraps are one of my favorite things to order because I can add exactly what I want. 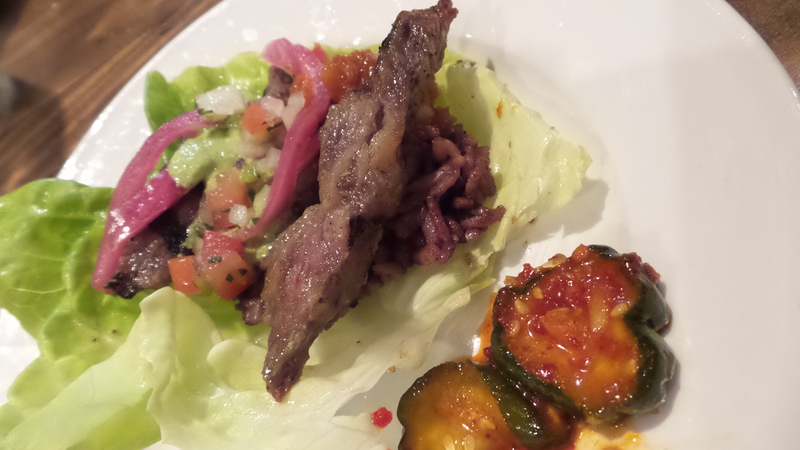 We started with butter leaf lettuce and grilled short rib and rice and were able to select from garnishes such as cucumber kimchee, pico de gallo, pickled red onion, fried onions, ssam jang, and green sauce. One of the most enjoyable aspects of the meal was the mix of texture, color and savory, sweet, sour, and pungent flavors that was in many of the dishes. 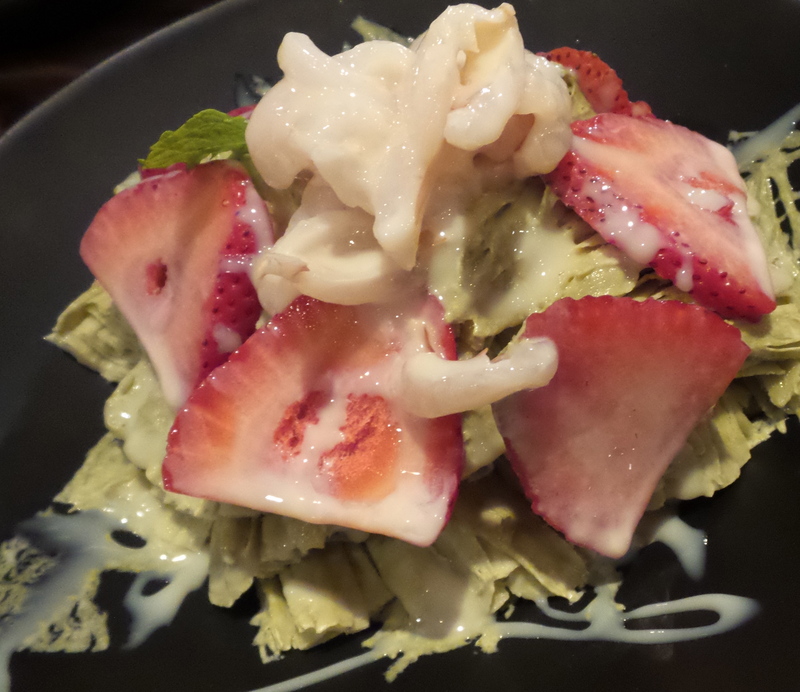 The Green Tea and Strawberry Shaved Snow desserts were no exception, with their creamy consistency shaved into a straw-like mound… a light and refreshing end to a delicious dinner. The prices are reasonable especially considering the quality of the dishes and the atmosphere of the restaurant. Many of the dishes are ideal for sharing making it a perfect spot not only for lunch but a casual dinner with friends. Urban Seoul 2.0 is located between Barnes and Noble and Macy’s with the entrance facing the outside of the mall.